Bus Rapid Transit provides limited stop service along the busiest travel corridors in the Capital Region. Sleek, efficient buses serve large, comfortable stations and enhanced customer amenities. CDTA has branded BRT service as BusPlus with distinctive signage that signifies premium service including stations, real time information and complimentary Wi-Fi service. Bus Rapid Transit is one of the fastest growing service categories in the country. Progressive transit systems use it as an alternative in communities without the level of density and customer volume needed for light rail. The flexibility and build-ability of bus rapid transit systems provides clear connections to economic development in areas where it has been introduced. Bus rapid transit service can be a building block to a dedicated right of way system, or eventually to a trolley line or light rail system. CDTA’s BusPlus service is the first Bus Rapid Transit Line in Upstate New York. It has been operating on Route 5 since April 2011 to critical acclaim and widespread customer acceptance. The award-winning service has resulted in 20% ridership gains and has CDTA positioned to expand BusPlus service to other high volume corridors as part of a plan to develop 40 miles of BRT. BusPlus provides limited stop service on the 17-mile stretch of Route 5 between downtown Schenectady and downtown Albany. The service also runs through Colonie and Niskayuna where 15% of Capital Region’s population lives and where 30% of jobs. BusPlus’ ridership was nearly 1.6 million during FY2013 and the Route 5 corridor has surpassed 4 million rides annually, providing access to Proctor’s Theater, Schenectady Community College, Colonie Center, the Capitol Building, Empire State Plaza and Downtown Albany. University at Albany, the College of Nanoscale Science and Engineering, the Harriman Office Campus and the College of Saint Rose. BusPlus service will operate through urban neighborhoods and business districts, providing direct connections to Downtown Albany. The corridor already has over 3 million annual boardings, making it the region’s second busiest. 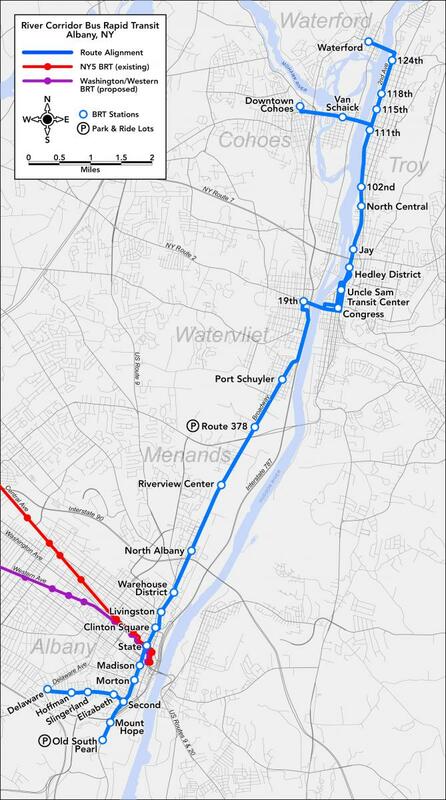 The 15-mile corridor runs along the Hudson River connecting Albany, Cohoes, Menands, Troy, Waterford and Watervliet. 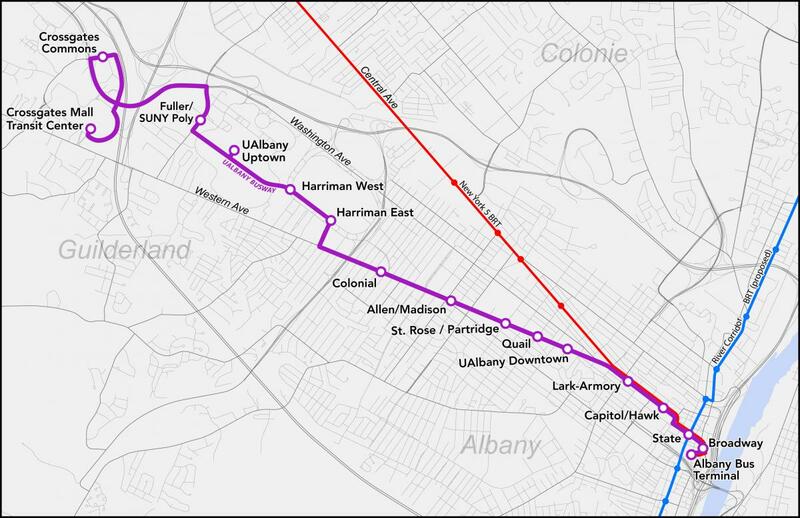 The corridor has a growing employment base and the service will connect to a host of CDTA services including the other BusPlus lines in Downtown Albany. The corridor has more than 2 million boardings annually, making it the third busiest transit corridor in the Capital Region. BusPlus will reduce traffic congestion along Route 32 and stimulate economic development while reducing parking demand in the bookend cities of Albany and Troy. Click here to view more infomation about BusPlus.